‘Milano da bere,’ went the saying in the 1980s – ‘Milan to drink’ – and it still holds true today. But what to drink, and where? Here’s Marco Zucchetti with an indispensable guide to the Italian city’s greatest whisky bars. The fog and the factories disappeared some years ago. Skyscrapers have been popping up all over, the cathedral is now white and clean. And – thanks to fashion and design – the city is grabbing the spotlight from other European holiday destinations. It must be said that – if every city were a drink – Milan wouldn’t be whisky. Business-oriented, hectic and posh, it’s more likely to be a futuristic bottle of sparkling Campari and soda, or a Swarovski gin and tonic. But things are changing and the ‘slow drinking movement’ is gaining status, with single malt Scotch perceived as the king of high-ranking products, and bartenders trying to spread the word of whisky culture. Now, whether you’re a businessman looking for a place to relax with a dram or two after dinner, or a Scotch-passionate visitor keen to enjoy your favourite malt after an evening at La Scala or the San Siro, there’s sure to be something here to take your fancy. Imagine the most anonymous Italian bar, hidden in a corner of a square full of traffic just outside the city centre. The place for a fast breakfast or a glass of prosecco at best. But, while having your coffee at the counter, your eyes slide up to the shelves and your spoon stops mid-stir. There are nearly 100 bottles of whisky here: a Miltonduff 24-year-old made exclusively for Bar Metrò; a powerful Lochindaal, a curious Dailuaine... not what you expect in a bar that closes at 7pm. Bar Metrò has been the understated temple of whisky in Milan for 40 years – the home of legendary whisky collector Giorgio D’Ambrosio. There’s no list here – you have to ask for prices, which range from €7 to €40 a dram. D’Ambrosio sold the greater part of his phenomenal collection of 11,000 bottles some years ago, but if you take the wrong staircase looking for the toilet, you can still find his cellar: Macallans from the 19th century and the 1930s, Karuizawas, Talisker from 1913 and other jewels. Note: Bar Metrò has closed since the publication of this article. Once it was a traditional local restaurant serving yellow saffron risotto. Now, between the Monumental Cemetery and Corso Sempione’s nightlife, there is an Irish pub. Probably the most authentic Irish pub in the city (built by Irish workers with Irish furniture), it has been managed for more than 20 years by Giuseppe Bertoni, who’s always ready to show you rare blends from the 1960s, plus his collection in the downstairs room used for tasting evenings (astonishing Samaroli Bowmore Bouquet). Mulligans is an Ardbeg Embassy, so the Islay malt is king: magnum bottles everywhere, and on the giant blackboard by the entrance you can find about 70 different malts with prices. Seven Ardbeg special editions, Glen Albyn 26-year-old, Port Ellen 32-year-old at €40 a dram. There’s an interesting selection of Irish whiskeys (hard-to-find Midleton Very Rare) and some Japanese malts (gorgeous Chichibu peated). Prices are intriguing, Bertoni’s knowledge is wide and deep, and the food is good (pork shank and Cragganmore = pure heaven). The ‘pubby’ atmosphere can mean noisy evenings, but who cares if the malts are good? The first rule of a speakeasy is: do not talk about the speakeasy. But we’re allowed to write about it, so you’ll know everything except for the address. For that, you should visit Mag Café in the Navigli area and persuade Flavio Angiolillo and Marco Russo to disclose the secret address. If you’re lucky enough to get in (it’s not so hard), you’ll find a little drugstore with a door. And behind the door a gentlemen’s club appears, furnished with a classy taste for vintage, leather and masculine style. A jump into the past, with soft jazz, sofas, warm light and menus like little books. A jump into the future behind the counter, where Benjamin Cavagna creates daring drinks with unique ingredients (try the Lighthouse of Scotland with ‘distilled earth’). And a jump into quality on the whisky list, where you can find nearly 70 malts, including Pittyvaich 25-year-old and Brora 37-year-old. More accessibly, Littlemill Liquid Sun, Laphroaig and Bunnahabhain cask strength and the whole range from Kilchoman. Claustrophobics keep away, because this promises to be ‘the smallest bar in the world’. It began as a storage room for the bar next door… then it became a mysterious bar you can enter only with a reservation. You book by phone (max three people, minus barman in a Guy Fawkes mask), and the bar – in the always bustling Navigli area – is yours for an hour and a half. You’ll feel like Alice in a spirits wonderland, sitting on a stool surrounded by floor-to-ceiling shelves full of whisky. Flickering lamplight reveals strange dolls, old maps, esoteric Tarot cards, little hot-air balloons… More Dali artwork than bar. Take a moment, select your soundtrack on an MP3 reader, then it’s time to drink: a restricted list of cocktails and a huge number of malts. Some precious, like a Port Ellen or Macallan seven-year-old ‘Giovinetti’, lost in a chaotic ocean of bottles. Opened two years ago, it has its flaws: drams sometimes poured in the wrong glasses, the lack of a list and, now and again, ‘Guy Fawkes’ isn’t knowledgeable enough. Sometimes you feel like whisky is more a piece of furniture than the real soul of the bar; it’s better for cocktails. Prices are high, but it’s still an amazing and memorable experience. Nice, comfy and easy, just like your living room. This is the concept of Casa Mia (‘My place’). Until now, you came to this lounge and bistro bar near Porta Venezia for Federico’s cocktails and the relaxed atmosphere; since October, you also come for the brand-new whisky bar, something that Milan was missing. That’s why Luigi and Anahita, Casa Mia’s managers, sought the help of Giuseppe Gervasio Dolci, one of the founders of the Milan Whisky Festival. The result is like a classic British whisky bar, but a little more ‘gourmand’: a long list of 170 malts (some available in half measures, for curious customers who don’t want to stop at one glass), gracefully served on a slate plate with delicious finger food like salmon or gorgonzola cheese, vaporised with malt if you desire. The whiskies? The ambition is to offer every Scottish brand available in Italy, with special attention paid to single cask and cask strength expressions.Here you can find every Milan Whisky Festival bottling (Arran Sherry cask at 58.9% abv will blow you away), unusual independent bottlings (try Cadenhead’s Glenlossie 23-year-old, bottled in 2017) and enough limited editions to make Casa Mia a single malt Luna Park. Prices are affordable, from €8 for Balvenie Doublewood to €40-50 for Port Ellen or Brora. Is there anything better after a bottle of Champagne? Beauty is in the eye of the beholder, but sometimes also in the eye of the customer. Hotel Yard’s lobby is one of the most elegant places to sit and enjoy your dram. There is a pizzeria, a cinema hall, a little Chinese room and the greatest smoking terrace in the city. Sitting on the leather sofas here, with a Cally 40-year-old and a sturdy Toscano cigar, is a clever investment of time and money. 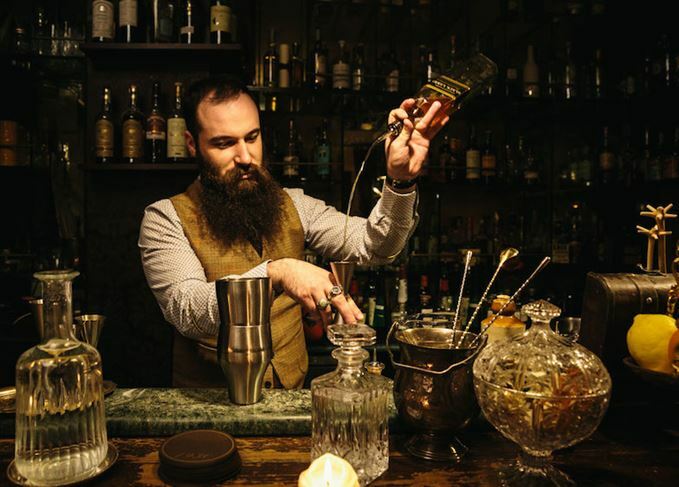 Bartenders Stefano and Omar used to work at The Savoy in London, and while the range is not terrific, it ticks all the right boxes: Sherried, peated, blended, Bourbon, Japanese, Taiwanese and Irish – pretty much a whisky for everyone. With more five-star malts and appropriate copita or Glencairn glasses, it’d be just about the perfect spot for dandy whisky lovers. Nothing is what it seems. The entrance: a heavy, black metal door with three portholes, two of them with bottles inside; through the other one you can see a magical bar. The Spirit – opened in May 2017 – really seems more like a theatre, with velvet, mahogany and warm lamps; you almost expect to see a rabbit jumping out of a hat. Design, service and above all quality spirits are the focus. Cocktails are solid and not unnecessarily sophisticated; there are 125 whiskies from all over the world – a dynamic selection made by bar manager Fabio Bacchi, one of the most respected spirits authorities in Italy. Every Scottish region, some special releases (Macallan Very Rare, Michter’s 20-year-old single barrel) and probably the richest Japanese selection in Milan, including Yamazaki 18-year-old and Nikka Gold & Gold ‘Samurai’ and ‘Knight’ editions. Malts of the moment are selected by Max Righi, independent bottler of Silver Seal. Malts are served on a metal portable table at your sofa, regrettably in a tumbler, but with a selection of dark chocolate, dates, hazelnuts and dried apricots. Prices are in line with the service and standard of the bar at €10-140. One plus: you can become a member, which gives you your own cabinet with your choice of bottles and glasses ready, like an extension of your living room. One minus: the music is a bit too loud (chill-out would be more appropriate). One of Italy’s Scotch whisky pioneers, and the man behind Milan’s legendary Bar Metrò.